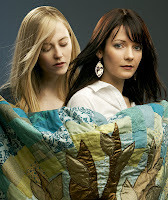 Canadian duo Dala, Amanda Walther and Sheila Carabine, released their fourth album Everyone Is Someone a couple of weeks ago. The album offers up a bevy of pristine harmonies. The lead single "Levi Blues" is one of those run barefoot in the grass, catchy songs that makes you smile when you listen to it. Curious to find out more about Dala, I sent over some questions and they were kind enough to answer. Quirky NY Chick (QNYC): I know some basic facts about Dala. For instance, I know you met in high school, that your name comes from combining your names Amanda (da) and Sheila (la) and that you have a big buzz in your native Canada. For those of us here in the US, who may not be as familiar as our friends up North, how would you describe your music? Dala: We like to describe our music as harmony-based acoustic pop. Think Joni Mitchell meets The Everly Brothers. We write all our own songs, and the writing is very personal. Our live show consists of two voices, two guitars and a piano. We like to travel as light as possible! QNYC: Your fourth album, Everyone Is Someone, was recently released. Tell us a little bit about the record. Dala: We d id a lot of touring between our last album and this latest one, and the Canadian landscape definitely played a part in inspiring the music. 'Northern Lights' was written over the course of one summer, when we played about six different festivals across the country. A lot of the album was written up North in an isolated cabin. Essentially we're wannabe pioneers :) 'Levi Blues' was one of those catchy songs you dream about as a songwriter, and we wrote it in less than an hour. 'Lonely Girl' is a response to someone who did his best to make us feel worthless; our first blatant brush with sexism. 'Horses' is about a young man we met who was in a serious accident about five years ago, an accident which left him confined to a wheel chair. He is unable to speak, and we found his story really moving. We write directly from personal experiences, and I feel like our new album contains some of our most honest writing. QNYC: The folk festival in Newport is celebrating its 50th anniversary in August, making it the oldest event of its kind. If I’m correct, you’re the only Canadian artist invited to play. What does it mean to you to be tapped to perform at the granddaddy of folk festivals? Dala: I don't think I can fully convey our excitement. We feel like we are going to be part of a little piece of history, and it is a complete honour. I grew up listening to my parents' Joan Baez and Judy Collins' records, and now to be on the same bill as them, it is just mind blowing. We will definitely do our best to be good Canadian musical ambassadors. QNYC: You say your influences include The Beatles, Joni Mitchell, Bob Dylan, Simon and Garfunkel, Neil Young, Fleet Foxes, Crosby Stills Nash and Young. If you could be a guest on one of their CDs, whose would it be? Dala: I don't know how I could choose between my musical heroes. I would probably be too star-struck to even speak in the presence of most of the people on that list. I would love to meet the Fleet Foxes, if only because we're from the same generation. There is something so exciting about how they are bringing the focus back onto acoustic music, with such an emphasis on harmonies. How could we not be in love with them? QNYC: Is there one song that you can say gave you inspiration to become an entertainer? Dala: I can't settle on one song, so I'll pick an album. I can remember the first time I heard Joni Mitchell's 'Blue'. It was a turning point in my understanding of music, as it was so intensely personal. I remember feeling really changed by it. QNYC: Everyone has a song that’s considered their signature song. Joan Baez and her cover of The Bands “The Night They Drove Old Dixie Down,” Pete Seeger, “Where Have All The Flowers Gone?” and Arlo Guthrie, “Alice’s Restaurant.” Which one of your songs do you think will become the Dala signature song? Dala: It’s hard to predict which songs are going to resonate with people. There are so many variables involved. S o far the song that has garnered the biggest reaction from audiences has been 'Horses'. It just seems to strike a real emotional chord with our listeners. QNYC: You'll be touring in support of Everyone Is Someone. Is there any place you’re looking forward to playing either for the first time or returning to? Dala: We've just started to play shows in the US, and so everything feels new and exciting in that respect. Personally I can't wait for the Newport Folk Festival. I'm just counting down the days! QNYC: Thank you for taking the time to answer my questions. In parting, is there anything you’d like to say to your fans? Dala: Thanks for listening! Hope to see you at a show sometime. I would like to once again thank Dala for answering my questions. Check out their video for "Levi Blues" from just released Everyone Is Someone.